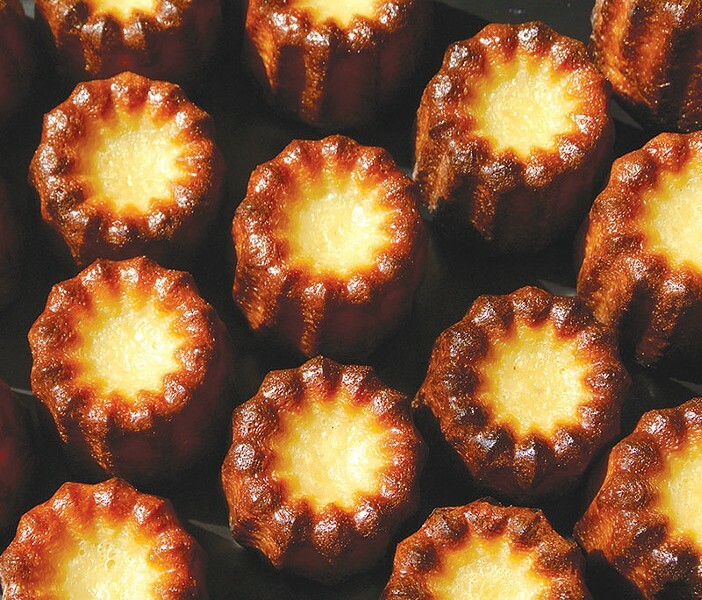 SUGAR, BUTTER AND FLOUR You won't find bear claws at Pascaline, but you'll find classic French pastries like these beautiful cannelés de Bordeaux. Sebastopol's Pascaline French Patisserie & Cafe looks like a simple cafe. And it is. Located in a small historic storefront on Highway 116 in a building that was originally built to showcase Gravenstein apples at the 1939 World's Fair on Treasure Island, eight-month-old Pascaline serves a small menu of sandwiches, salads and soups, and a beautiful assortment of baked-that-morning pastries showcased in two large glass display cases. But the thing about simplicity is it takes years to achieve. It's a stripping away of the extraneous and the forced that leaves behind technique so skilled and refined it's hard to notice it's even there. In it's highest form, simplicity comes close to perfection. And Pascaline is pretty near perfect. The business is the work of two French masters, executive chef Didier Ageorges and pastry chef Celine Plano. Both began their culinary training in France at age 14. Their professions have taken them to some of the most celebrated hotels and kitchens in the world, rigorous training and experience they bring to Pascaline. Ageorges and Plano met at the Ritz-Carlton San Francisco. Ageorges was executive sous chef and Plano was executive chef of pastry, the only female in the position at the time at any Ritz hotel. Ageorges left the Ritz to become executive chef at Chalk Hill Winery, while Plano worked at other Ritz-Carlton properties, the Four Seasons and as chef and technical advisor for Callebaut, a premium chocolate manufacturer in Chicago. When Ageorges left Chalk Hill last year to open his own catering business, he called upon his old colleague Plano to join him. Smart move. Many of Plano's creations sell out by mid-morning. Her pastries are smaller than their supersized American versions, but are huge on flavor and technique. And butter. The croissants are hands-down the best I've ever had, especially the almond croissants: flaky, yet moist inside, with a delicious marzipan and almond crunch. "I'm very proud of our almond croissants," Plano says matter-of-factly. The silken flan with its crispy, flaky crust and creamy pudding is fantastic. Come early to get a kouign-amann (pronounced something like "queen-on-yawn"), a muffin-shaped pastry that's really a flour-and-sugar superstructure designed to hold unholy amounts of butter. Plano started baking them to entice her friend and chef at the Ritz-Carton Half Moon Bay to come visit. He hasn't yet but it's his loss. They're now a house specialty. While the cafe menu is small—half a dozen sandwiches, soups, salads and daily specials—everything I tried was superb. There are no afterthoughts. "We are cooking everything," says Ageorges. "That makes a huge difference." The ham and cheese sandwich, elevated to a croque-monsieur, is an example of Pascaline's best-of-class approach and attention to detail. Plano bakes the brioche for the sandwich. The molten cheese is the perfect counterpoint to the thinly sliced ham. Even the small side salad served with it stands out for its judiciously applied creamy but tangy caesar dressing. I ate every last bit—along with everything else I had here. Pascaline French Patisserie & Cafe, 4550 Gravenstein Hwy. North, Sebastopol. 707.823.3122.